Vietnam, from the primitive moment of building the country border, has itself gone through many milestones and events in order to shape its appearance like today. Tracing back to the time when Vietnam still had king as the son of the God, Vietnam, especially Hue, the used-to-be capital city, was the royal land where Nguyen Dynasty was established and Nguyen kings stayed there. Among all of them, Emperor Tu Duc would be the one who was mostly mentioned for his kind personalities that until after his death, people still rememorize him and visited his mausoleum as a sign of gratefulness and admiration. 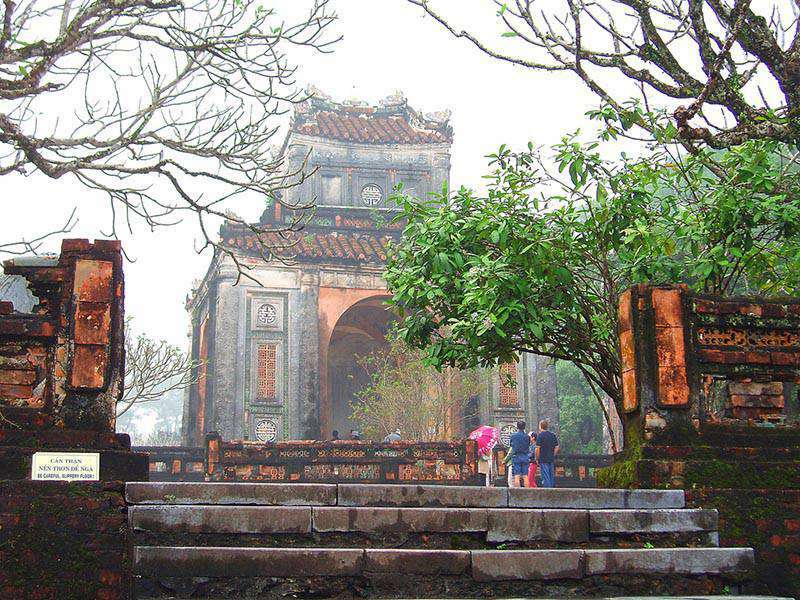 As one of the unique attractions in Hue, Emperor Tomb of Tu Duc is located in a narrow valley of Duong Xuan Thuong village (currently Thuong Ba village, Thuy Xuan commune, Hue city). It was the place where he could retreat from the Citadel to compose poetry or go hunting because the monument was finished when the king was still in reign. The design of the tomb is said to clearly reflect the profound knowledge and romance of the king’s characteristics. With 36-year reign, Emperor Tu Duc was the longest-reigning monarch compared to other 13 Emperors of Nguyen Emperor. Considered to be a kind-hearted king and a gentle poet as well, the Emperor ascended the throne in difficult social contexts with foreign invaders outside and fraternal dissension fighting each other for the throne. Being the leader of the country at that time, however, the king himself was not always healthy. 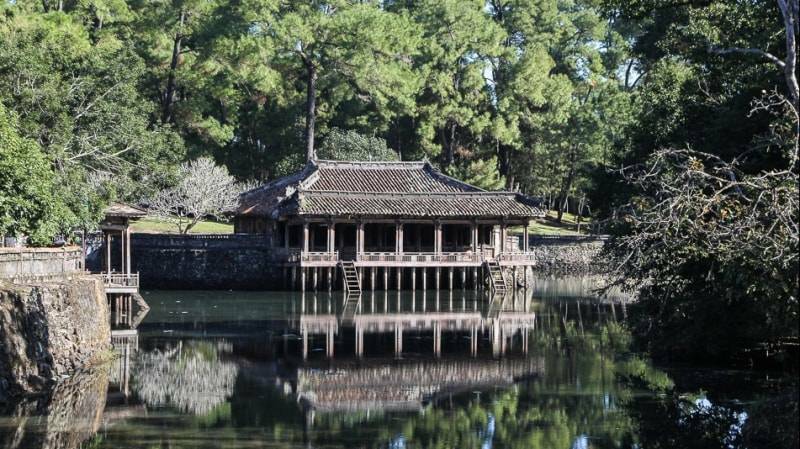 To avoid the harsh life, Emperor Tu Duc built the complex as a second palace for his divertissement and the preparation for his resting place. When having started the construction, the Emperor called the construction Van Nien Co. Constructed between 1864 and 1867, however, the tomb required an incredible amount of money and labour, thus resulted in a rebellion of workers. Therefore, it was renamed Khiem Palace. Finally, it was called Khiem Lang (Khiem Tomb) after the Emperor died. In addition, all the constructions’ names were changed to bear the word Khiem (Modesty) in their names, as the king wanted to express his humility. Unlike the architecture of other tombs in Hue, Tomb of Tu Duc consists of two main parts, arranged on two parallel vertical axes. 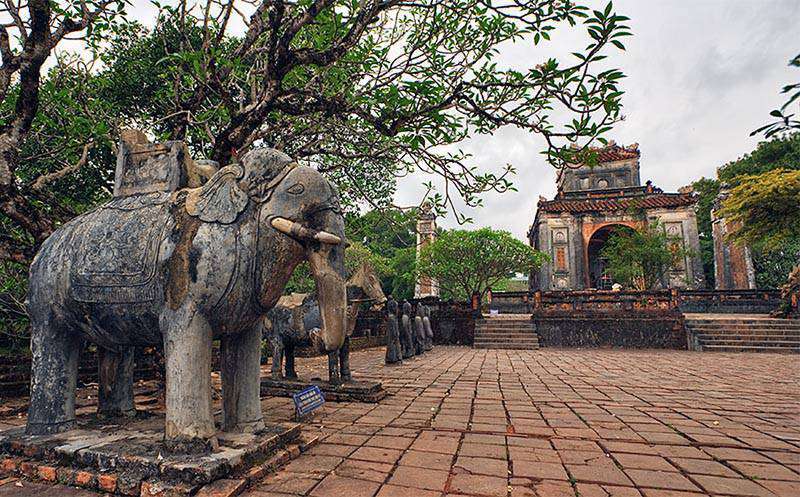 The panorama of Tu Duc’s Tomb looks like as a large park. Here, there are always the sounds of the flowing stream, of rustling pine hill, and of all the birds singing. In particular, the factor thoroughly adhered in the tomb of Tu Duc is the harmony of contours. There are no straight lines, angular architecture as others, but Bat Trang brick-tiled roads instead departs from Vu Khiem door through Khiem Cung Mon and winds in front of the tomb and suddenly hides in giant plumeri near Tomb of Queen Le Thien Anh. The creation of the locals in harmony with the natural landscapes creates lovely and magnificent scenery. In the allure of the heaven and earth along with the its fragrance, people find easy to forget that it is the resting place of a deceased person but imagines a paradise of trees, of poetry and dream. Needless to say, Tu Duc Tomb is a masterpiece poem, a charming picture of the peace in the overall transcendent architecture of tomb construction art during Nguyen Dynasty. The tomb deserves to be one of the most impressive attractions for tourists who are seeking for the peaceful atmosphere of nature and explore the unique architecture. 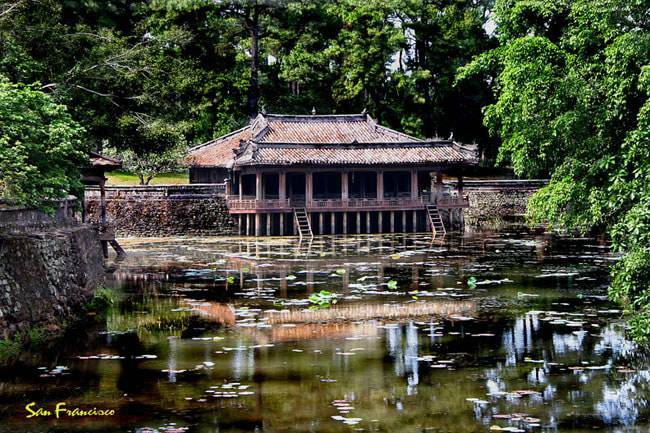 Thanks to its unique and charming beauty, Tu Duc Tomb has been attracting an enormous amount of visitors inside Vietnam and outside the border as well.